I also waited 20 seconds between trigger pulls to allow full heat recovery in the coil. Even then a lot of what came out the spout was liquid that ended up on the bottom of the nuc. I found the process tedious and not really all that fast at over three minutes per nuc each treatment. Also, oxalic acid will react very rapidly with alcohol make the ester and the ester will very rapidly decarboxylate at temps as low as 100 deg C to ethyl formate which is not going to kill mites. If you are going to fog ethanol solutions you probably need to make fresh solution just prior to fogging to avoid the inevitable ester formation that is going to happen on storage even at room temp. This chemistry is not a problem in water solution but needs to be considered in alcohol or particularly glycerin which some are using. When OA dribbling package bees (or perhaps any bees), I’ve received a report from a good source that the bees tolerate the dribble better if they are full of nectar or sugar syrup–presumably because they are then less prone to imbibe the OA syrup. There has been lots of response to my article on OA/gly in ABJ (soon to be posted to this website). I’m in communication with EPA to get this application method approved. Be sure to check my article in Jan ABJ on OA/glycerin http://scientificbeekeeping.com/oxalic-shop-towel-updates/. I’ll try to post soon. The evidence that I’ve seen to date indicate that vaporization does not have serious effects on the queen. On the other hand, there are indications that repeated dribble may. In our operation, we don’t notice any effect on queens from spring treatment of nucs, or from one-time fall treatment of colonies with dribble (but we haven’t run controlled trials to compare rates of winter queen failure). My GUESS is that repeated exposure to HIGH concentrations of OA likely is stressful to queens (for example, when applying vapor at 5-day intervals to obtain good efficacy in colonies with brood). Worker turnover in colonies is rapid in summer, so adverse effects on workers from cumulative exposure may not be as noticeable as with queens. Colonies thrive during warm weather under chronic exposure via OA/glycerin, but a beekeeper in Chile says that use during damp winter weather can result in wing burn off in queens. Take home–we don’t yet know enough to give a definitive answer. * I checked the hives 4 days after and everything seemed fine. All continued to have laying queens with solid brood patterns, there were no issues with absconding, or mutiny vs the queen. * Since installation, the hives have moved to multiple locations across Northern Minnesota and Wisconsin and have been exposed to a variety of difficult weather conditions. (We had snow and freezing temperatures in late May). Thus the robustness of each hive has been slightly weather dependent, but it appears so far they are not populated with Mites. A reference from X said that due to the mode of action of OA, it is impossible for mites to gain resistance to it. The above is a good example of someone talking out of their [hat]. No one even knows for sure what the mode of action of OA is against varroa, nor how it is absorbed. And no matter, I can assure you that some mites will be more resistant than others, which implies that some degree of resistance is possible. Remember, there is only a small margin of safety between the dose that kills mites, and the dose that kills bees. That means that varroa only needs to develop a slight degree of resistance until OA is as toxic to the bees as it is to the mites. Rotate treatments! My friend Rob Stone (Pierce Beekeeping) recently treated treated a number of packages of bees for sale by spraying a total of 30mL of “weak” solution divided over the four sides of the package cages, and was happy with the results. The typical dosage of oxalic dribble is 5 mL (1 tsp) per “seam” of bees between the frames. Solution spilled on the top bars doesn’t count. I suggest applying it carefully in order to best distribute it throughout the hive. Although some researchers caution about applying more than 50 mL per colony, we routinely treat every seam of bees, even if it takes close to 100 mL total (we may get away with this because our broodless period in the California foothills is very short). 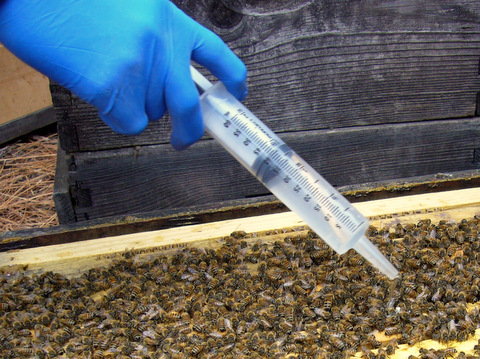 For application to only a few hives, use a teaspoon or 60 mL syringe (from any feed store). Dribble being applied with a 60 mL syringe. For commercial use, we use a garden sprayer set to a gentle stream, calibrated by the use of a graduated cylinder, to dispense 5 mL per second (1 seam of bees per second, less than 20 seconds per hive). Calibrating the output of the stream to 5 mL per second. Tip: maintain a large reservoir of air above the liquid–this will reduce the amount of fluctuation in the flow. With practice, it is easy to eyeball the correct stream. In fall, we treat the bees in both brood chambers. If the cluster is mainly in the lower box, we tip the upper box back and apply the oxalic from below. If the cluster is mainly in the upper box, we take off the lid and dribble each box from above. I’m applying the fall treatment while Eric tips back the upper box. We often work in three’s, with two cracking and one squirting. You’ll get the highest efficacy against varroa if oxalic dribble is applied when there is no sealed brood present. This opportunity occurs as a result of natural or induced brood breaks. In temperate regions, natural brood breaks typically occur in November through early December. 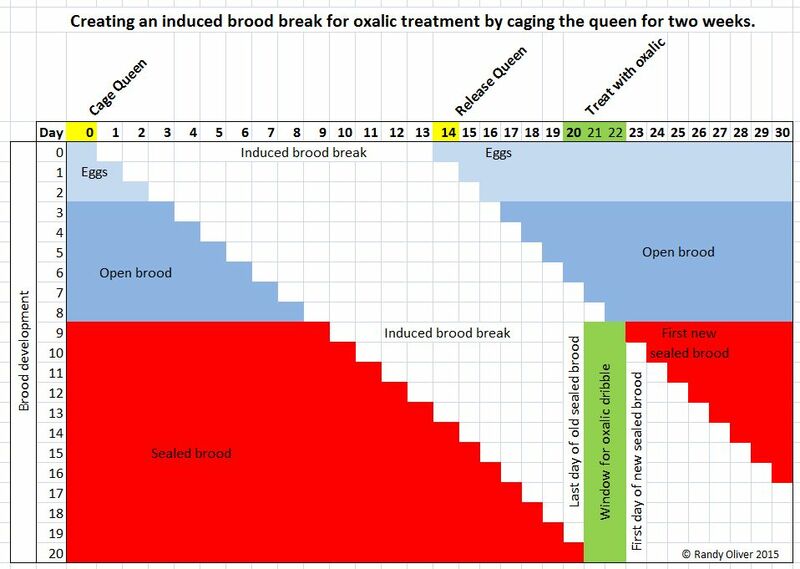 Alternatively, you can induce a brood break by making shook swarms, or by caging the queen for 14 days, as shown below. By caging the queen for 14 days, you can create a 2-day window in which there is no sealed brood in which varroa can hide. Note that this window occurs starting about 6 days after you release the queen. 42 mL per 4-lb package. The 2.8% solution is roughly the same as the “weak” formula at Treatment Table. The authors note, however, that their results were preliminary, and I haven’t seen any follow-up research. If you do treat some packages, please let me know the results! Alternatively, although you could directly treat bees in a package, I’d suggest installing them normally, and then treating them in the hive between Days 5 and 7 after installation. The timing is due to the fact that even if the queen starts laying eggs the day after installation, it wouldn’t be until Day 9 that the first brood would be of suitable age for mite invasion. Oxalic dribble kills mites for roughly 3 days after application. Thus, if you dribble the recently-installed package on Day 6, the full effect of the treatment will have taken place prior to the first opportunity for the mites to hide in the brood. You can also use this method with shook swarms, or for any divide made without brood. Nucs: Starting nucs with queen cells in spring presents a great opportunity for controlling varroa by dribbling on Day 19. We’ve now used this method on thousands of nucs, and really like it for getting a “clean start” each spring. Figure 1. The theory behind the early treatment of nucs—it’s all about timing! There is a brief window of opportunity from Day 19 to Day 21 after make up in which every mite in the nuc is forced out of the safety of the sealed brood. A short-term treatment applied at that precise time could result in a very effective kill of the now-exposed mites! I’ve fully described this method at http://scientificbeekeeping.com/simple-early-treatment-of-nucs-against-varroa/. An even simpler method is to make “walkaway splits”–that is, splitting a hive (into two or more splits) and allowing the queenless split to raise a new queen (although I do not particularly recommend this method, since it depends upon the splits raising emergency queens, plus the splits go without any new brood production for at least 24 days, during which laying workers may develop). The key is to make up the split containing the old queen without any sealed brood (so that all the mites are exposed to treatment). Leave this split on the parent stand to pick up the field force. Into the other (queenless) split(s), place all the sealed brood (any open brood is also fine), along with most of the bees (since all the field bees will fly back to the parent stand). Treat the split with the old queen on the day you make the split(s). Treat the queenless splits on any day from Day 21 through Day 30. Oxalic dribble is not as effective when colonies contain brood (as during spring or summer), but colonies at that time do appear to tolerate stronger or repeated doses due to the rapid turnover of the adult population at that time of year. I don’t have data on efficacy, but I’ve treated colonies once a week for three consecutive weeks in late summer without noticing adverse effects (although we prefer thymol or formic acid at that time of year). 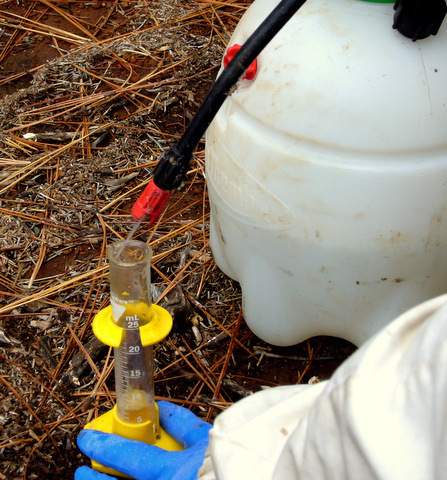 There is a narrow range of dosage that will kill varroa without harming the bees. 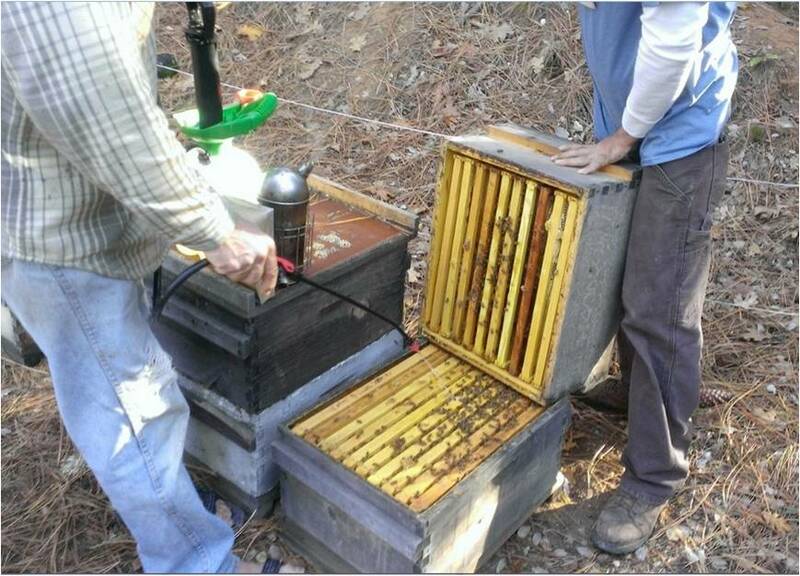 Follow mixing and application rates meticulously; see (http://scientificbeekeeping.com/oxalic-acid-treatment-table/). Use common sense when handling oxalic acid crystals. Wear glasses in case of a mishap—you don’t want to get it into your eyes! Wear latex or nitrile gloves to remind you not to rub your eyes. 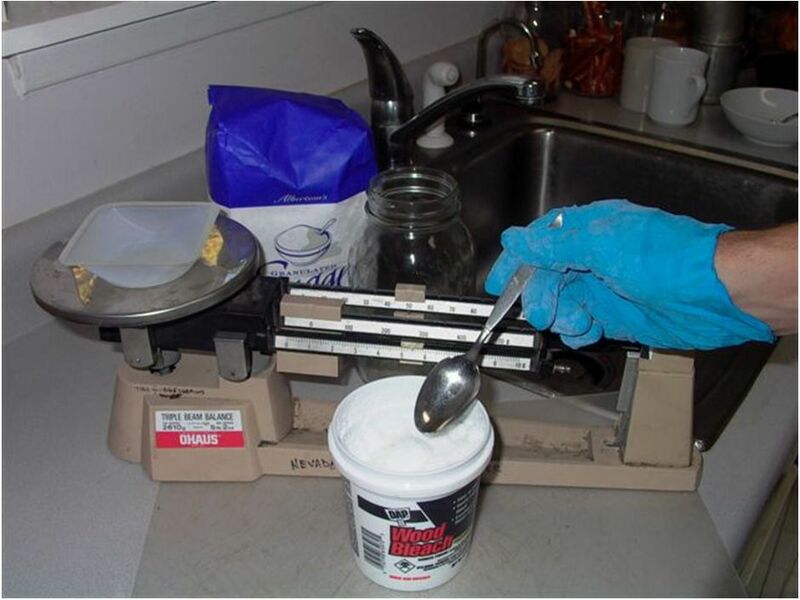 Weigh the oxalic acid crystals carefully–they cannot be accurately measured by volume (such as by teaspoon measurement). It’s no big deal to get either the crystals or solution on your skin—simply wash off with water. If you suspect that there is some oxalic syrup on your skin, taste it (it tastes like strong lemonade). Don’t worry–you eat plenty of oxalic acid in common vegetables. You can completely neutralize an oxalic acid spill with some baking soda dissolved in water. If your water is hard (contains calcium), use distilled water instead (calcium will cause some of the oxalic acid to precipitate as white calcium oxalate). We prefer to first completely dissolve the crystals in hot water, and then add the sugar. 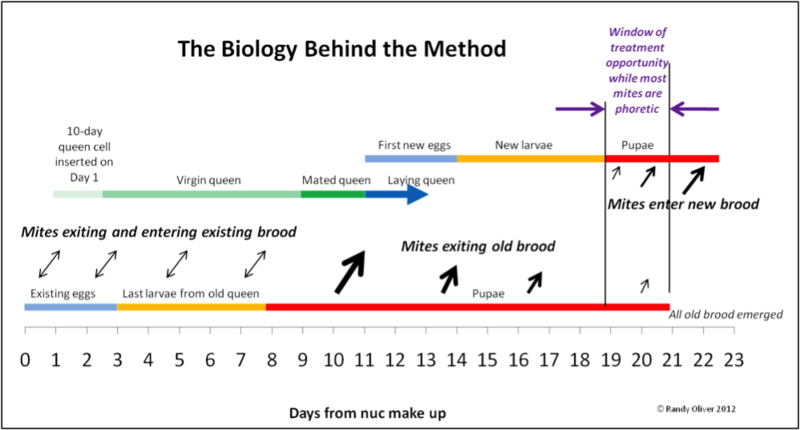 Oxalic acid in a sugar solution will eventually form HMF [[a]], which is somewhat toxic to bees. It’s unlikely that enough will be formed under normal use to harm the bees, but you should not use a solution that has begun to turn brown. Oxalic syrup can be stored for many months if kept refrigerated [[b]]. [a] Hydroxymethylfurfural, non toxic to humans; commonly found in cooked jams and jellies. [b] Prandin, L, et al (2001) A scientific note on long-term stability of a home-made oxalic acid water sugar solution for controlling varroosis. Apidologie 32: 451–452. Open access.